Do not read farther if you don’t want to read about the latest Avengers sequel rumor. Alright last chance to stop reading….ok here we go. The internet is swimming with rumors of Ms. Marvel making an appearance in upcoming Avengers sequel, and the ladies of Hollywood are scrambling to win the coveted role but I’m sure as you can tell by the above photo the two lucky ladies in the running are Emily Blunt and Ruth Wilson. For those of you who might have not been thrown into the nerd culture as much as myself here’s a little history lesson for you. Emily Blunt was originally the top contender for the role of Black Widow in Iron Man 2 (which I would have loved), now being played by Scarlett Johansson but had to back out due to another role. After a little research I also just found out she also turned down the role of Peggy Carter in Captain America: The First Avenger. Ruth Wilson is known mostly for her TV roles but is starring in upcoming The Lone Ranger alongside Johnny Depp. Blunt is clearly more recognizable which might give her the upper hand when it comes down to the final decision. Personally I have no frame of reference for Ms. Marvel so I’m going to let the readers decide who would make the best addition to the Avengers team. 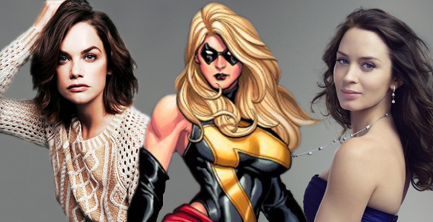 Does anyone else feel it’s strange that Ms. Marvel is blonde and yet no blondes are in the running?